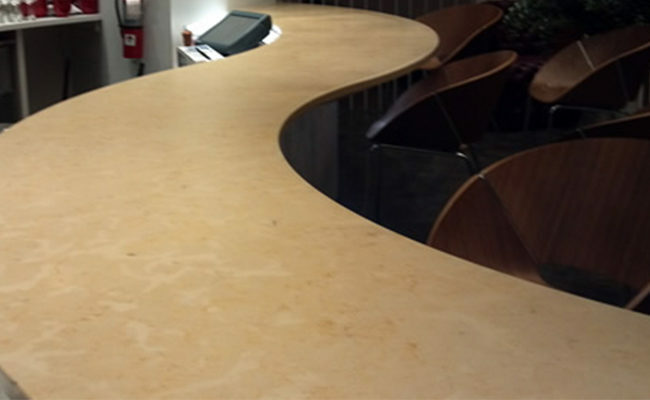 Beverages regularly served at Virgin Atlantic Clubhouse at JFK contained acidic substances such as fruit juice that were continuously causing etch damage to this Jerusalem gold limestone surface. High traffic and use cause fine scratches and dullness. The property manager wanted to keep the decadent, Uptown-style space in impeccable condition all the time, without having to deal with refinishing and maintenance services every few months. 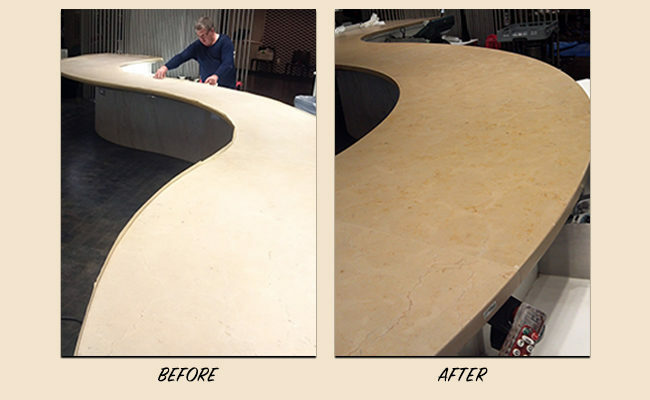 In most cases, a natural polish and sealer are adequate to keep natural stone looking great between regularly scheduled maintenance services, but in this case, the extremely high traffic and acidic substances called for extra measures. On our first visit, we honed the limestone to remove the the etch damage (see the BEFORE image), and then applied StoneGuard®, a thick, clear polyethelene film that incorporates chemical resistant technology. This gave the limestone top an extremely durable and lasting elegant finish. Every year since then, for five years now, we stop by for a simple refinish and reapplication. To learn more, visit our Protective Treatments page. Send us a message or give us a call at (888) 400-4302 for a FREE estimate on marble and limestone protective treatment services throughout the NY, NJ, and CT area.